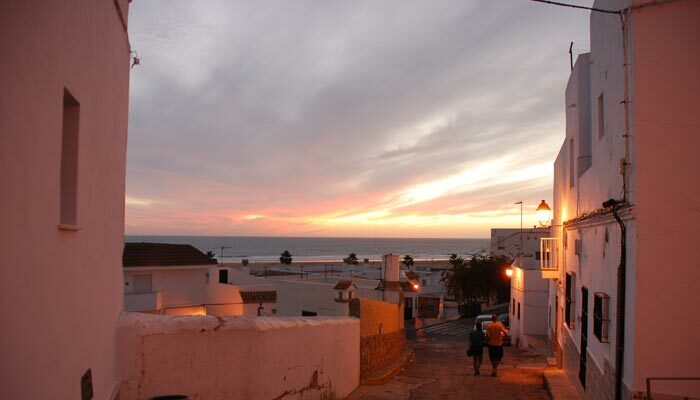 Conil de la Frontera is a beautiful old fishing village on the Atlantic coast. With over 3000 hours of sunshine a year it is known as the Costa de la Luz. 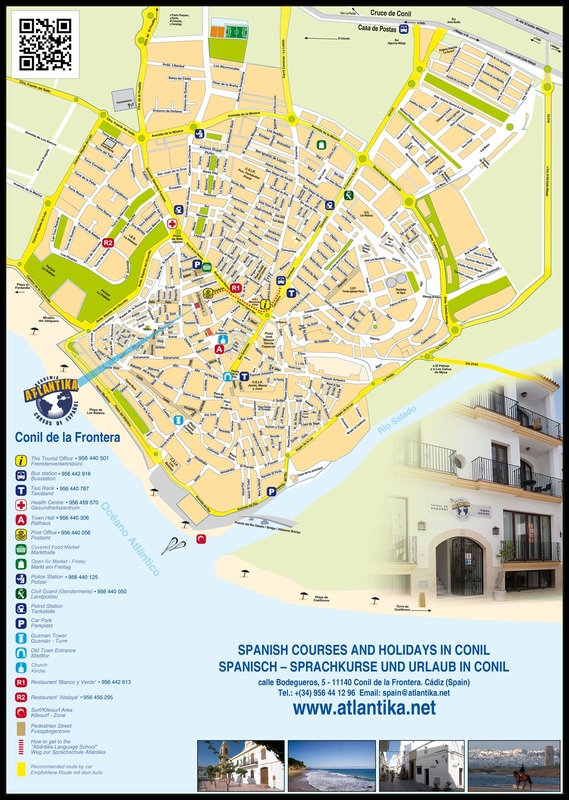 Our school is located in the center of Conil. The Academy building was built in the traditional Andalusian style, complete with charming courtyard and a roof terrace. The closest airport is Jerez de la Frontera, followed by Gibraltar, Seville and Malaga. From these airports there are regular bus services to Conil. sheer cliffs, hidden coves and lush vegetation make this area one of the most attractive in southern Spain. The old town of Conil retains all the charm of an Andalusian village, full of narrow streets, whitewashed houses and courtyards full of flowers. Our school is located in the center of Conil; a few minutes walk from the beach. The Academy building was built in the traditional Andalusian style, complete with charming courtyard and a roof terrace with sea views. all of which are available for use outside the course. We provide computers with free Internet access, and Wi-Fi is available throughout the school building. On our patio, you can enjoy your breaks and our impromptu paella and sangria parties. “All roads lead to Rome” and Conil. The closest airport is Jerez de la Frontera, followed by Gibraltar, Seville and Malaga. From these airports there are regular bus services Conil. 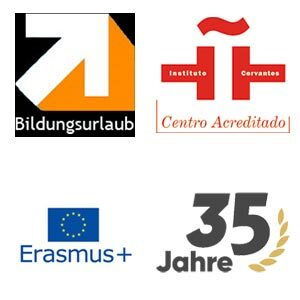 To get here from Jerez de la Frontera we can assist in organising a rental car for several students, to share the cost. You need to be responsible for the organisation and booking of your flights and ground transport, but we will be happy to help you find flights and timetables for buses and trains. By car, the journey to Conil from Jerez Airport is approximately 40 minutes, from Gibraltar and Seville airports 1.5 hours and 2.5 hours from Malaga airport. 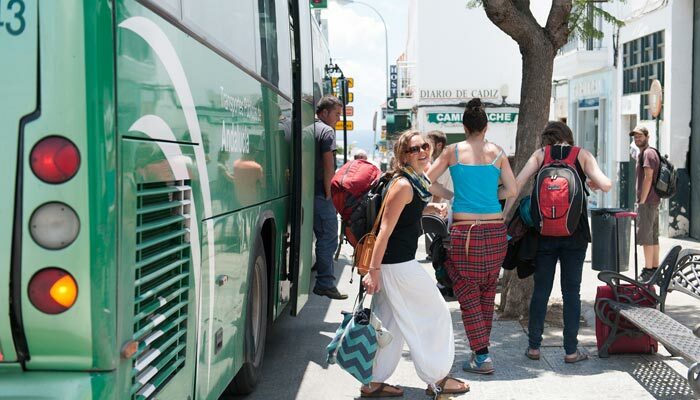 There are excellent flight connections to Madrid, and many of our students take advantage of the opportunity to visit the capital; transport connections by bus to Conil are quick and inexpensive. In the following pages we have summarised the various transport links.